A year ago this week my friend Hollis Hawthorne fell into a coma as a result of a motorcycle accident she suffered in India. Her progress has been slow but steady and both her friends and her family have been blogging about it and documenting every milestone. For instance, recently her friends blogged as of the beginning of this year, she’s been singing and humming to songs she listens to on her iPod. In the blog that Holli’s mom keeps she reported that yesterday Hollis was being evaluated to see if she is a candidate for the Shepherd Center of Atlanta, one of the top rehabilitation hospitals in the nation, specializing in medical treatment, research and rehabilitation for people with spinal cord injury or brain injury. These blogs are very poignant reads, so be sure to check them out by visiting FriendsOfHollis.com. As a network of kith and kin I think we did a pretty amazing job of fundraising to get Hollis back home. However, her family is still burdened with out-of-pocket medical expenses recently such as the purchase of a new custom wheelchair and Botox injections in her right arm so they can stretch her arm out in order to place a brace on it to straighten it. 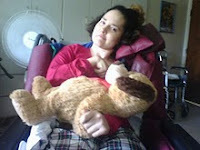 There are other numerous costs as you can well imagine so fundraising for her medical continues. If you have a bit to spare, please donate to Hollis.